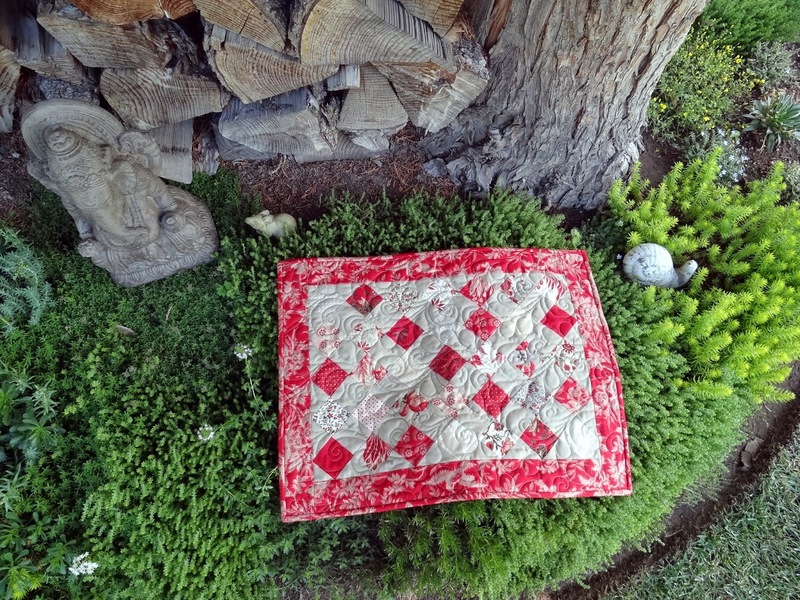 Squash House Quilts: A Second Quilted Finish! It's beautiful! It may have taken you longer than you expected, but it was certainly worth all of your time and effort. Gorgeous! You've done a great job in spite of Gracie May. Feathers are so wonderful and I love French General, too.....have some in my stash and I keep looking for a way to use it. Also in my stash is some train fabric (my DH's hobby, HO trains). I think one piece for the back of his recliner and another for a lap quilt would be just about right. You're an inspiration! Good for you - glad you are feeling well enough to quilt! Love that little one and it looks perfect on that chair. So nice (lol) that you had such good help! That's a very sweet little quilt. Obviously you are enjoying your long arm. Good job!! What a sweet little quilt! So perfect for the back of Mr.SHQ's recliner! 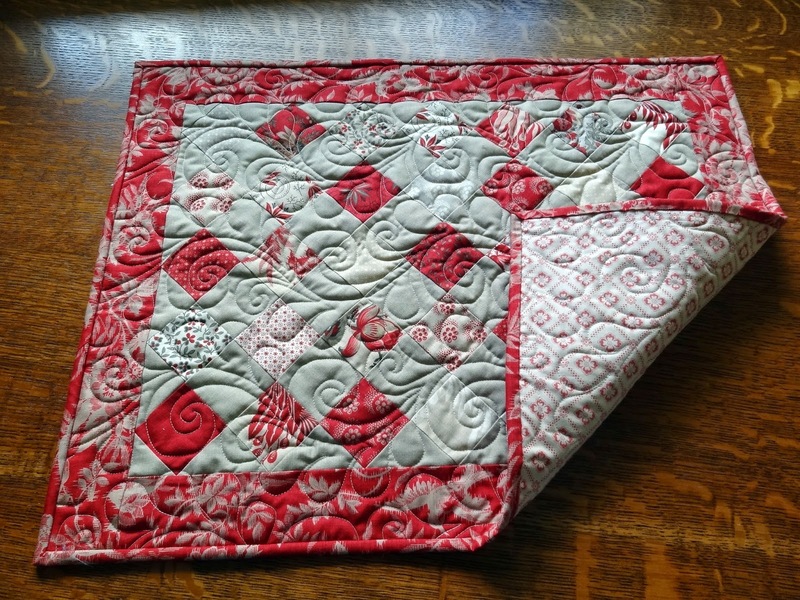 Cute little quilt, and your quilting is beautiful! I have a similar chair, and my two cats have taken to sleeping up up on the back of it. Perhaps they need a new quilt to make it more cozy? Mr. Squash's fairy garden is adorable! You did a great job with your mini quilt. Did you quilt the feathers free hand? They're very good! Great to see you on the longarm again. It looks so pretty and the quilting is just beautiful. 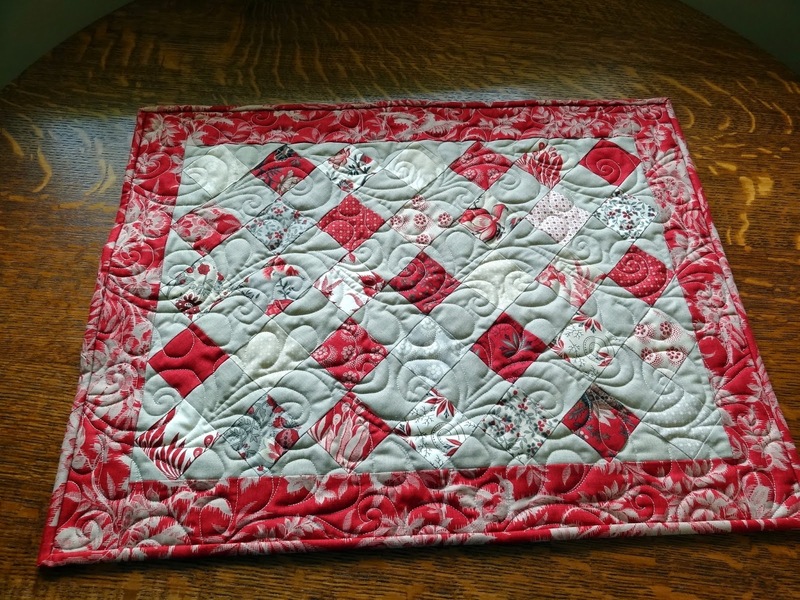 You and Gracie May did a fantastic job of quilting this between you. I love the fabrics and the quilting design. This is such a pretty addition to Mr. 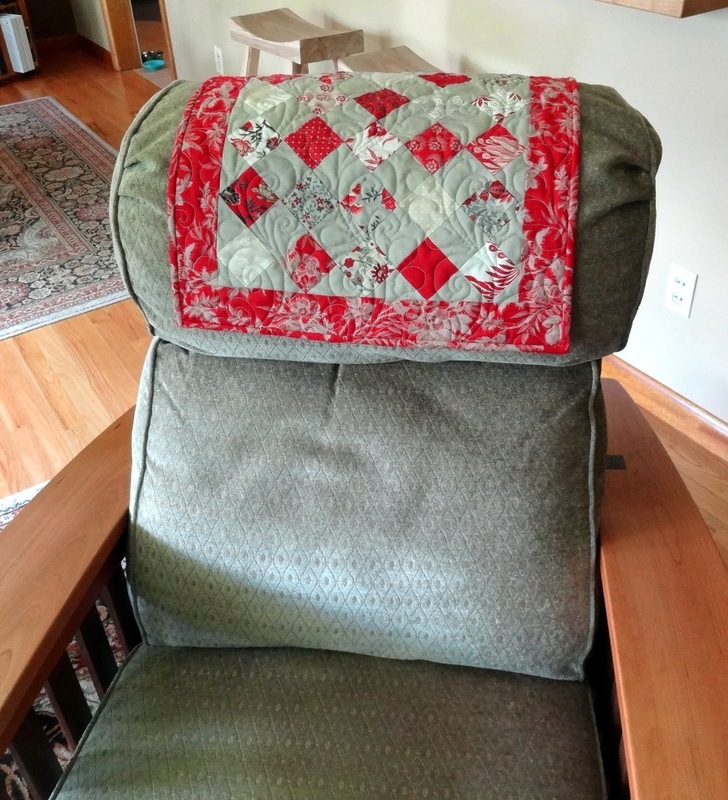 Squash's recliner and I just love the lighter squares here and there which give highlights to the quilt. Sounds like Gracie is full of mischief and curiousity, but you prevailed nevertheless. The Fairie garden is adorable and you should take a couple of pictures of the hubs hobby to feature on your blog someday. So pretty. And it looks perfect on the back of the chair. Well done, just don't overdo it at the long arm! Lovely colours and beautiful quilting. Your quilting is so pretty. I love the design you chose. Silly Gracie is a challenging kitty. A perfect companion to the mister's chair. So you are the Squash House Gardeners? It's really pretty! I love the picture of it in Mr Squash's Fairy Garden. It looks right at home on his chair, too. So pretty Candace. The fairy garden looks like such a magical area. I like French General fabrics too. It was well worth all the extra effort.